1. The screen prints you sell – Brockwell Park, Ritzy Cinema, Brockwell Lido – are very much inspired by the local area. I lived off Brixton Hill for 1.5 years and now in Herne Hill for 3 years. Most of the ideas for the stuff I do are generated by local people and places. That’s why I also love Makerhood – the idea of hooking up local buyers and sellers. I’m exhibiting a print of Brockwell Lido at the Lido – they’re going to put it up after redecorating. My Ritzy print was inspired by a competition they ran to celebrate 100 years of the Ritzy. 2. So you’re a great promoter of this area! I’ve always lived around here, apart from one year I lived in north London. I spent all my time there explaining to north Londoners how great south London is – they have no idea! 3. What was your graphics training and background? I’ve been a graphic designer for 15 years, since graduating from the Surrey Insitute of Art and Design in Epsom. I’ve worked mostly on magazines as well as posters, brochures and so on. I’m currently working for Camden Council – it’s always a surprise to be walking around the West End and suddenly seeing a poster or something I designed! 4. How did you get into screen printing? I did some screen printing when I was at college, but now everything is digital – I just sit in front of a computer all day. Then I found out about Bainbridge Studios in West Norwood, about 10 minutes from my house. After doing a refresher course I can now book space to use the print studios and equipment there. All I have to bring is paper and ink/paint. For me it’s a way out, a release, from my day job. It feels really good to be using my hands and getting dirty, covered in ink! 5. You seem to like combining photographic and hand-drawn images. That’s true. Sometimes I digitally alter photos or change them by drawing over the top. Then I have to decide which elements will be in which colour and separate out each colour. It’s very time consuming, as you have to wash the screen and recoat it for each colour. 6. So why did you decide to join Makerhood? I was interested in selling locally. I heard about West Norwood Feast first and liked their approach and the fact that they were generating interest in the area. But I didn’t have enough work to take a whole stall. Then I found Makerhood through Twitter and went to a local meeting to find out more. I was attracted by the idea – and here I am! 7. Finally, what’s your favourite place or experience around here? Brazas is great. It’s lively but relaxed and friendly, and I can always get a table. I love their desserts, especially the chocolate Baileys cheesecake. However, they seem to have taken it off the menu recently, so I’m campaigning for it to be reinstated! You can keep up with Ray’s work on his blog. 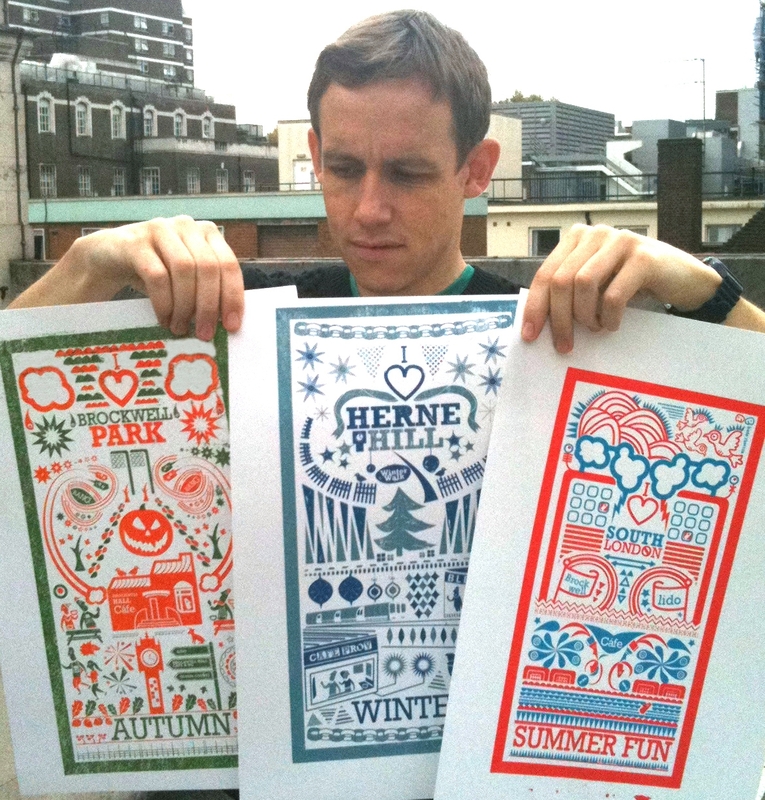 His colourful local prints and bags are available at http://brixton.makerhood.com/ray-stanbrook. You can also see one of Ray’s prints on show as part of a Makerhood exhibition at the Lounge in Brixton until 26 November.